Photo by Jody Isaackson Area emergency personnel responded to a crash in Lincoln County Monday morning. LINCOLN COUNTY — Two people were injured in a two-vehicle crash Monday morning west of Minneota, the Lincoln County Sheriff’s Office said. The crash was reported around 11:27 a.m. at the intersection of Lincoln County Road 18 and Lincoln County Road 8, the Sheriff’s Office said. A 2011 Toyota Camry driven by Sara Beisler was traveling north on County Road 8 and crossing the intersection, when it was struck in the rear passenger side by a westbound 2017 Ford Expedition driven by Lisa Buseth. 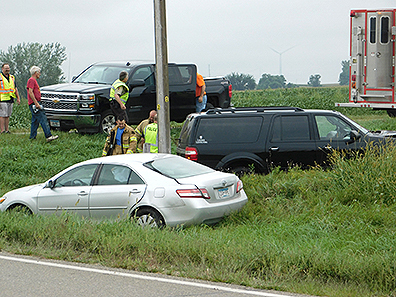 Both vehicles ended up in the northwest ditch of the intersection, the Sheriff’s Office said. The County Road 18/County Road 8 intersection is a two-way stop, with the stop signs controlling north-south traffic on County Road 8. Both Beisler and Buseth were transported to Avera Marshall Regional Medical Center with non life-threatening injuries, the Sheriff’s Office said. Their vehicles sustained significant damage and were towed from the scene. The crash is under investigation, the Sheriff’s Office said. The Minneota Fire Department and North Memorial Ambulance responded at the scene of the crash.